Figaroscope, a weekly insert in the French newspaper Le Figaro that focuses on food, art, theater, music and entertainment in the City of Light, just conducted one of its famous Tests Gournamds du Figaroscope (“Foodies Test”) that aimed to determine which Parisian patisserie/boulangerie serves the very best pain au chocolat. Pain au chocolat is a tasty treat that I often order with a cafe creme for my petit dejeuner when in the City of Light. And while I always snag at least one (or, as is usually the case, several) during my special outings to Laduree, Pierre Herme and Stohrer whenever I visit Paris, the truth is that I’ll try one of the chocolatey confections at just about any patisserie in the city. OK, enough of my rhapsodizing about my pastry preferences. 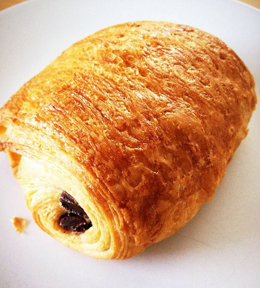 Onto Figaroscope’s “best pain au chocolat” competition. 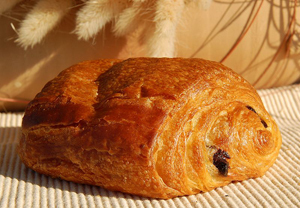 The research team evaluated the pains au chocolat sold at 24 of the most well-known patisseries/boulangeries in the city. 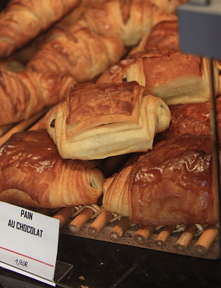 All of the pastries were subjected to a blind taste test, with up to five points awarded in each of four categories: Appearance (including shape and color); Dough (taste and consistency); Chocolate (too much or too little, too sweet or too bitter); and Value (this category was weighted according to the price of the pastry, which ranged from a low of 1.15 euros to a high of 2.10 euros). And the winner is … Lenotre Bastille, 10 Rue Saint-Antoine in the Marais. No. 2: Ble Sucre, 7 Rue Antoine Vollon in the 12th Arrondissement, with a score of 16.5. 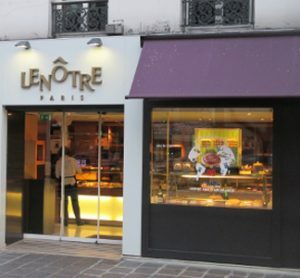 No.3: A tie between La Patisserie des Reves at 93 Rue du Bac in the 7th Arrondissement and Pierre Herme at 72 Rue Bonaparte in the 6th Arrondissment with a score of 15.5 (these two shops had the most expensive pastries at 2.10 euros each). No. 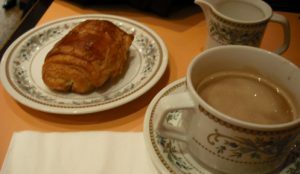 5: A three-way tie between Liberte at 39 Rue des Vinaigriers in the 10th Arrondissement, Juliien at 75 Rue Saint-Honore in the 1st Arrondissement and Des Gateaux et Du Pain at 89 Rue du Bac in the 7th Arrondissement with a score of 15. No. 8: A three-way tie between Laurent Duchene at 2 Rue Wurtz in the 13th Arrondissement, Maison Landemaine at 26 Rue des Martyrs in the 9th Arrondissement and Sebastien Gaudard at 22 Rue des Martyrs in the 9th Arrondissment with a score of 14.5. The other finishers: Patisserie du Pantheon and Angelina with a tie at no. 11; Delmontel at no. 13; Dominque Saibron, La Patisserie Cyril Lignac and Stephane Vancermeersch with a three-way tie at no. 14; Laduree and Fauchon with a tie at no. 17; Bread & Roses and Dalloyau Raspail with a tie at no 19; Du Pain et des Idees at no. 21; Stohrer and Carette with a tie at no. 22; and in the last-place slot is Le Quartier du Pain. 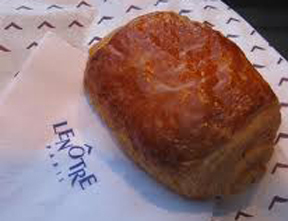 I’ll definitely be sampling the pain au chocolat at Lenotre during my next visit to Paris! This entry was posted in Boulangeries, Food, Patisseries and tagged Angelina, Ble Sucre, Bread & Roses, Carette, Dalloyau, Dallyau, Delmontel, Des Gateaux et Du Pain, Dominque Saibron, Du Pain et des Idees, Fauchon, Juliien, La Patisserie Cyril Lignac, La Patisserie des Reves, Laduree, Laurent Duchene, Le Quartier du Pain, Lenotre, Liberte, Maison Landemaine, pain au chocolat, Patisserie du Pantheon, Pierre Herme, Sebastien Gaudard, Stephane Vancermeersch, Stohrer by Bob Adams. Bookmark the permalink.